Our new dealer, SO Engineering requested support for MaxxEcu Engine Management Systems. After a bit of research, we found a very concise and easy to use CAN mapping documentation page on their website. 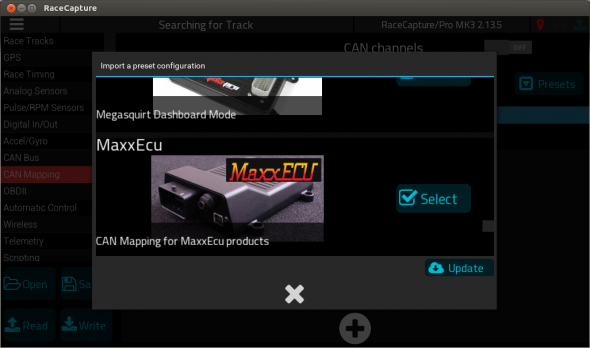 These are the channels that most will need; If you want to access additional channels provided by the MaxxEcu, our CAN mapping tools makes it easy to map additional channels. To use this integration, simply connect your RaceCapture system, navigate to Setup / CAN Mapping, press the Preset button, and then press the cloud update button. The MaxxEcu preset will then be available for use. Be sure to set your CAN1 baud rate to 500K under Setup / CAN bus and you should be good to go after connecting two wires!